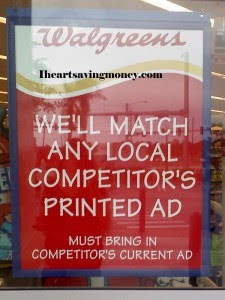 Have you been at Walgreens recently? If so, did you happen to see this sign? Looks like another store is on the price matching bandwagon! As you do with other stores, you will need to bring in the ad. Since I have not personally used this, I am not sure of the policies or procedures, so we’ll have to learn together! If you try this out, please share your experiences so I can pass them along to other readers!